If Ellen White's prediction about the papacy regaining its lost supremacy was ever to come to pass, the papacy was going to need a lot of money. And the papacy is quite wealthy today, but how did it amass its great wealth in its amazing comeback since 1929? Given the secretive nature of Vatican goings on, and its lack of public disclosure laws, that's hard to tell for sure. But Joe Coffey, a Catholic detective from New York City, can tell you where he knows some of the wealth came from. Along with the founding of the "state" of Vatican City in 1929, the papacy got its own bank, its own radio station, and its own post office. The bank is what we want to look at for a moment. Joe Coffey describes what happened in a 1982 book called The Vatican Connection. His job was to investigate the mob, and in doing so he followed around a fellow named Vincent Rizzo, which took him to Munich, Germany in February 1972. There he was with some other cops listening in on a bug to the conversation going on in Rizzo's hotel room, when the Vatican came up (p. 74). 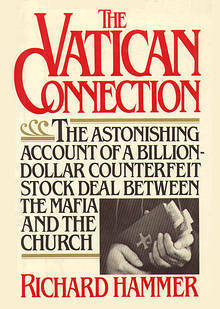 Turns out that Vatican officials had contracted with the American mafia to purchase $950 million in counterfeit securities, securities such as stocks and bonds. The Vatican and the bank of Italy would pay the mafia $625 million for these securities, and the mafia would in turn give a kickback to the prelates of $150 million, leaving the mafia with $475 million for their trouble (p. 212). Why would the Vatican want counterfeit stocks, you ask? The way modern banking works, you can loan out and invest in proportion to the amount you have on deposit. In actuality, you can loan out more than what you are holding on deposit. So if the Vatican Bank's policy was that it could loan out ten times its reserves, a billion dollars of phony stocks on deposit would allow it to make ten billion dollars of investments. When Cardinal Tisserant first asked swindler Leopold Ledl to get him the counterfeit stocks, Ledl was concerned about what would happen if the deal ever came to light. Tisserant waved that away. He was not at all concerned, he said, nor were any of those he had discussed this with. They all agreed that the American government would never accuse the Vatican of knowingly dealing in counterfeit stocks and bonds. In fact, if it was discovered that such paper existed in the Vatican, the United States would undoubtedly believe the church had been taken by some unscrupulous swindlers and so would secretly step in and make good the losses.—p. 212. In the end, American authorities did more than not deal with the Vatican-mafia connection. They transfered Joe Coffey to a lesser post. —back side of jacket of The Vatican Connection. Ten years later another Vatican bank scandal broke after the president of Italy's largest private bank, Banco Ambrosiano, was found swinging by his neck beneath a London bridge. The story made headlines, for the scandal involved multiple banks in multiple countries. Banco Ambrosiano was near collapse because of $1.25 billion in unsecured loans to Latin American subsidiaries, loans that had been guaranteed by the Vatican Bank. 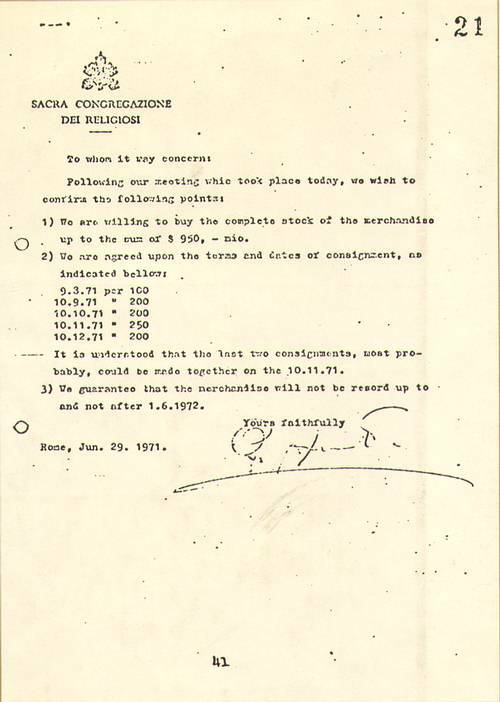 But the Vatican claimed to have a letter from the dead bank president releasing them from that pledge (pp. 309, 310). Years later, while listening to an international news broadcast on shortwave, we heard the conclusion of that case. After mentioning the various individuals who had been convicted, the reporter added, "The Vatican was exempted from prosecution." What do you think about Ellen White's prediction of the papacy's regaining power? It just might happen. Who knows? Since the papacy isn't interested in power, I don't think it will ever happen. Lord John Acton, though a Catholic, was an anti-Catholic bigot when he said those things. The papacy would be tickled pink if Ellen White is right.